With AI, machine learning, and big data, companies have more information than ever about their customers. But, says Jason Harper, too many companies collect data for the sake of collecting data. They’re not analyzing it effectively, which means they can’t use it to guide business decisions. Jason, CEO of data science company RXA, shares how you can get clarity on how to determine what data is important… and the latest technology you can use to make sure your data actually has value. Dave Antil: Welcome to Performance Delivered: Insider Secrets for Digital Marketing Success, where we talk with marketing and agency executives, and learn about how they built successful businesses, and their personal brand. I am your host, Dave Antil. Today, I am overjoyed to welcome Jason Harper as my guest. Jason is the CEO of RXA, and he himself is a data scientist, a storyteller, and a guide. We’re going to learn more about that. Over the past 20 years, Jason has helped usher in the era of big data and analytics we are living in today. Before founding RXA, Jason ran analytics for a division of Ford. Examples of Jason’s work can be found in The Wall Street Journal, MIT Technology Review, and more. Jason, great to have you on the show. Jason Harper: Hey, Dave. Thank you. Great to be here. Dave Antil: Yeah. Tell me about RXA. What do you guys help companies do? Jason Harper: Well, we’re a … consider ourselves an applied artificial intelligence company. Really our focus is on … it’s helping companies take advantage of all the kind of headlines you’re reading about AI, and big data, and all those great new technology in the billions and trillions of dollars of investment and research that’s pouring into it. We’re trying to help companies today take advantage of all that stuff really fast. We’re trying to stay out in front of the curve as to what’s coming, but also know what’s available now, and how can we put this together to help companies really use and get all of the great benefit that were kind of reading about in the headlines. Dave Antil: Cool. Good. I want to dig into that in a minute, but first I want to go back in time a little bit and learn a little bit about you. What was your first job in marketing and advertising world? Dave Antil: There’s much better parties in the marketing and advertising world. Jason Harper: … “What in the world?” Yeah, so I started there in 2000, January-ish of 2000, and started analyzing goto.com, was I think some of the first ad campaigns I was looking at, pre-Google. Dave Antil: Wow, back in the old days. Dave Antil: Yeah, and just a shout-out to the Beyond Interactive, there are a ton of people in the industry who have Beyond Interactive on their resume, so that was a launching … a breeding ground for a lot of folks in the digital ad space these days. Jason Harper: Yeah. I mean, it was a crazy, like unbelievable, crazy time. Like we worked our tails off, and yeah, it was definitely an experience. Dave Antil: Right, right. Now, from Beyond, how did you get involved in the data AI side of things? Was that right out of the gate, or did you kind of work yourself into that? Jason Harper: Well, when I started there, I joined on their marketing optimization team, so this was doing data science back in 2000 on these marketing campaigns, all digital marketing campaigns. It was really basic. We were just doing a lot of Excel-based reporting. Everything … I became like a VBA expert, and crazy pivot tables, and VLOOKUPS, and all of the joys of being an Excel wizard. Jason Harper: Yeah, that was really the start of it. I felt there we could probably do more than equations in Excel, and so I from there decided to pursue academically statistics. So, I went back to school and did a master’s in applied economics and econometrics, and was like, “How can I … I want to take this stuff and apply that to the digital data, and then just kind of see what happens.” I guess it was more of a curiosity. Dave Antil: Right, right. Then you pursued that on the agency side, and then you went to work at Ford. Tell me about that. Jason Harper: Sure. Well, even prior to Ford I did, as you said, so the agency side, so ton of time over at … in the WPP world, and then where we met at Omnicom-land, the Organic, which hopefully we get to talk about that. Dave Antil: Can those be working? Yeah. Jason Harper: Right. So, we did a ton of work kind of in and around the … Data aggregation at that time was very manual process, too. This was before any, every … This was all … like we had all of our servers and I had to kind of learn that environment. But being able to piece it together to figure out … One of the things I learned there was like, “Holy crap, Howard Stern really works.” Unbelievable, it just like … you knew … like you could predict how much we were going to make when we were on Howard. Those were the types of things that when … That was really one of the first like true like real media mix media attribution type things that I was doing myself and looking at, right? So, that was … I spent a couple of years there really understanding how media expenditures from a … wherever, online, offline, everything … can really drive the business. That’s to me where my roots really kind of took hold, I would say. Dave Antil: Right. Then when we met at Organic, you were doing some really incredible stuff with analytics, and econometrics, and building models to predict sales, and media mix. Tell me about that, because I think that’s fascinating, and it’s going back to 2008. Seemed like that’s the first time that that was really explored in the media business, in the digital media business. Jason Harper: Yeah. We got out in front of that one pretty good. I mean, that was one of those things where just the stars aligned. We had this perfect mix of … we had clients who needed us, we had incredible support from the agency, and we had … we were able to put together a great team. So, that’s really … I feel really lucky. We had folks like yourself on the account team, helping make sure that we had the right audience. Because we were at the time digital … we were an analytics group at the digital Agency of Record for these large companies … like Chrysler, that’s when that got us written up in The Wall Street Journal, like that’s where we … We as this little kind of newly formed practice … When I started there was no analytics group at Organic. I was hired in as a digital strategist. We were able to kind of pull that out, and we had some great leadership, not that I’m biased, but folks like Marita Scarfi, Steve Kerho who saw the vision of like, “Hey, let’s … you know, there’s something here, Jason, we’re going to support you in this. We pulled out the team, and that’s where we were able to sit and go, “Hey, Chrysler …” One of the first recommendations we made was actually like, “Don’t spend some money.” This was one of the things I think kind of helped put us on the map where you have your agency coming to you saying, “Hey, this …”, and I want to say $60 million. We’re not talking reallocation. We’re talking you need to actually save this, because you’re not going to get the return on this that’s needed to justify it. That was sort of like the first thing that I think put us on the map. Then we were able to do from there was to really help them understand using digital signals, so using like consumers’ digital behavioral data, you know, website traffics, and bead submissions, and things of that nature, how we could take that and help them figure out like, “How many cars are we really going to sell with this campaign?” Then, “How can we optimize like our TV spend to make sure we hit our sales goals in real time?” This is us using those digital metrics, and this is before anything was connected. We were literally running this on … We had some old QA machines that were leftover that we stitched together under one of our developers desks. That was kind of the spirit of Organic, was like I think they really gave us the opportunity, and then we had the right mindset and the right people to pull it off. Dave Antil: Yeah, yeah. It was some good times. The client really learned to lean on the digital agency to help them determine what they should do. I remember sitting in meetings with them where they would always ask, you know, “What do the models tell us?” Even with the traditional media agency, they would look to you and say, you know, “What do the models tell us we should do?” That was a real breakthrough on the getting the client to lean on you and your team to help them. Yeah, that was a great time. That was an interesting time on the agency side, and now what was your motivation to founding RXA and kind of taking this on the road yourself? I was at some conference and I remember talking to Jonathan, one of the cofounders of RXA, about this is that … I’m at some conference and I’m watching this kid up on stage talk about this cool analytics thing he’s doing, and I’m going, “Holy cow, this kid is smart.” They’re doing this really cool stuff, and I’m just sort of like, “I’m missing it. I want to go do that,” right? It was really like that combined with the fact that I really enjoy keeping my hands dirty. I like getting in and coding, and building stuff, and working with customers, and I like … From an agency perspective, one of the thing that I didn’t realize how much I would miss until I didn’t have it, but was that multi=client environment. That definitely adds a lot of stress when you’re working on … On Organic it was between, what, Hilton, and Chrysler, and Nike, and all these like big clients, and Kimberly-Clark. I mean like these giant things that they don’t care at all about the other people, right? Dave Antil: Yeah, yeah, yeah. Jason Harper: You need to do my stuff now, right? Jason Harper: It was like, “Oh, well, if I was just working on one”, and then it’s like … You know, I like having … Now at RXA, we’ve got … I think we have 35 clients today, and they range global marketers to local service center things, and it’s everyone in between. That part of the excitement of working with lots of different customers, being able to solve lots of different problems, kind of simultaneously, and then also I really like being able to talk to like ESPN. They’re one of our customers … like being able to talk to them, and work with them on something, and then also talk to like Belle Tire, they’re like the regional tire service center. It’s like there’s things that … we’re helping them optimize their labor, and we’re helping ESPN optimize customer experience. Seemingly two totally different things, but you know what, there’s things that they both could be thinking about that would be helpful. Jason Harper: Being able to kind of cross-pollinate where appropriate it’s just nice to see, and the clients really appreciate that too, like we’re really transparent about, “Hey, we’re doing this with so-and-so, what do you think? You know, things like that. Dave Antil: Yeah, yeah. Yeah so let’s talk about your clients, and why do companies or agencies call you? What’s the problem they have that they know that they need to call RXA? Jason Harper: Well, it’s a little bit different based on the customer, and that’s really more the fact that we’re a startup still, we’ve only been around for a few years now, and so I’m a little bit lacking focus. We could talk about that later. But when agencies call us … We do work with a lot of different ad agencies, and some of the larger holding companies, some of their agencies as well. What we’re really … what we’re looking to do there is draw on our agency experience, and help them say, “Hey, we understand that you have multiple customers, and you have probably a thin analytics team that spends most of their time hunting for data.” So, what you end up happening is a lot of waste, so you’re just gathering, gathering, gathering, and then right before the report’s due, it comes together, and you hand it over directly to the customer, or maybe get a few minutes to think about it. Jason Harper: We have a bench of analysts. You may not necessarily as an agency want to have a full-time data scientist, or have a team of full-time data scientists, because you may not need that. Well, we provide that service in sort of like an on-demand environment. 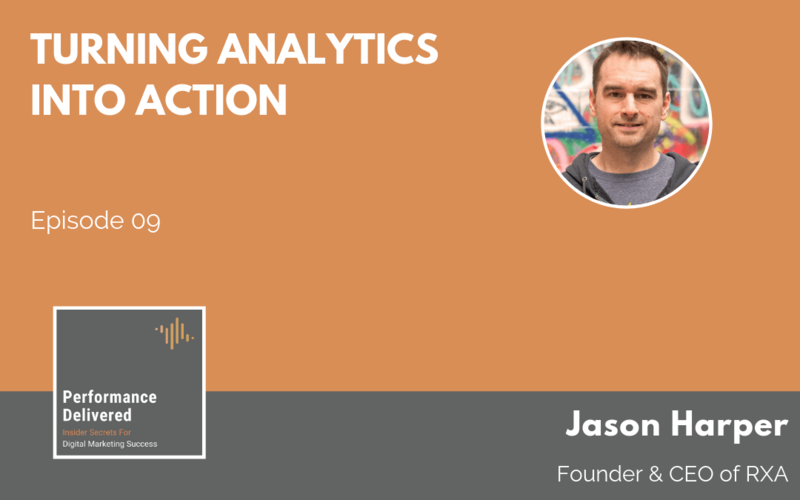 Jason Harper: It’s really helping agencies kind of go from kind of the old way of doing things in analytics, to just overnight have a word-class analytics practice that’s really efficient. Dave Antil: Sure. It’s interesting. Talk a little bit about some of those kind of plugin products that you have, because I know that can solve, as you said, immediately some big problems that clients have. Jason Harper: Sure. We have some data visualization software that we use, that we can drop in, that typically helps solve a lot of problems really quickly. We do use Domo, that’s one of our partners, so give them a plug. I mean, that’s really our preferred. But we can help you drop in anything, whether it’s … on that end. Once we have the data platform and the visualization platform in place, that’s where now we have all of these pre-built applications that can plug right in. Customer segmentation, forecasting, anomaly detection … we’re doing a ton of work right now, really over the past year, with what we call Voice of Customer. What we feel is really unique about our offering is that it’s got an open back end. What that means is … We collect and we do like social listening, so we’re scraping, for lack of a better term, about a billion customer comments every day. That’s not including Twitter and Facebook. This is from like the broad news articles, message boards, forums. So, you get a real deep understanding of what customers are talking about a brand. We can bring in Twitter and Facebook too, but it just doesn’t seem to add to the conversation. We have this platform that we can collect all this data, and then we deploy these text analytics algorithms that we’ve written on top of it. We’ve got things that do like, what we call, theme detection, and categorization, and scoring, and then we use like a variety of APIs to do translations, and sentiment analysis, and all that. So, you get a really quick read on what your customers are talking about. Lots of companies do this to that point, but where we differ is we actually can connect in to not just your social listening data, but your call center data, email data, chat, survey. Any type of customer feedback that you’re getting, we bring that in. Then in addition to the comments that we’re collecting, we can also bring in news articles, and things like that. So, you end up getting this like full view of your customer experience, as told by what your customers are telling you through those channels, what your customers are telling each other through the forums, and then what media is telling your customers. So, you kind of get a good view of that. Then taking it one step further, we’re going to bring in your business metrics into this equation. We want to see what’s your sales, what are your KPIs, how do they relate to this data, and how can we use what we’re finding in this data to help inform your sales forecast, and then from there, help inform your product mix, and your product development, and all of those things. It becomes sort of like a really rich, actionable kind of thing, versus some of the other approaches where these things are siloed. Dave Antil: Right, right. It helps … it puts kind of credibility into the whole ecosystem, and it sort of closes the loop a little bit, right? Jason Harper: Well, that … Yeah, and that’s like when we talk about when customers come to us. I mean, the goal here is we need people to make decisions differently and better because they’re using their data. So, it’s not just about like these … When we’re helping customers with it, it’s … and this is something that’s just that like when you’re putting in an analytics solution, you got to begin with … like the first question is: why are we doing this? What are we trying to solve for differently? What’s the business objective of this exercise, and how are we going to measure that? We have a really clear, “I’m doing this because I’m going to get X, and here’s the business value,” like, “If I do this, this is worth $30 million to me,” or whatever that number is. That’s the starting point, and then everything gets … everything needs to align to making better decisions to drive this business objective. Dave Antil: Right, right, right. I would assume at some point some of the feedback gets back into messaging, and just how … and branding for the companies as well. Jason Harper: Yeah, I mean you get into things … Part of our … just kind of one of the standard things we look at is sort of the relationship between things that we’re seeing in the customer conversation that can inform messaging. Jason Harper: These are the things that we can deploy. It’s super powerful, and it’s fast. I mean, we can put that together for a brand and have it live within like a day, sometimes even a couple hours. Jason Harper: All on our own data. Dave Antil: All with your own stuff. You talk about kind of big brands and millions of impressions. Is there any slice of this which is kind of available or accessible on a small scale to like small and midsize companies and agencies? A lot of our audience and listeners are kind of in the small, mid-size range. What can they do … how can they take advantage of kind of some of this kind of AI big data machine learning? Dave Antil: That’s fair. You can go ahead. Jason Harper: Right, friends here … overnight, right? Like you don’t have to invest half a million or more in a big data environment, and hire a team of data scientists and analysts and things. That’s where an agency’s going to fall into trouble, is that smaller agency isn’t going to be able to have a business analyst, a data scientist, a data engineer, each of these different roles, and a visualization expert, like there’s all these different roles that you kind of need to have. If you try to hire someone who’s a jack of all trades, they’re out there, but you’re going to … it’s not going to be as efficient, right? Jason Harper: Where we come in is like, “Oh, great news. You need … ” Let’s say you have ten clients that you want to put on a reporting platform. Great, you can get that with fractional data scientist people, because we’re going to … We have the full stack of folks. So, when it’s time for the ETL development, cool, data engineer, have at it. When that’s over, great, okay, we just plug and play in with business analysts, or visualization person, or that storyteller role where we have account managers that will then help translate this to your account team. So, it’s whatever is needed there is sort of like we can scale up or down. I know we’re talking to another … we’re talking to an agency that … I think they got 17 people. They’re out of Ohio. Actually, it’s an ex-Beyond Interactive person who reached out to me last week. They’ve got some customers who they actually … they’re really small. It’s like, “Yeah, we don’t have any hours to do any analysis,” but they need to know what’s going on, so we just want automated report for those. Yeah, that’s not a problem. Put in the system, and it just auto-emails a report out once a month … done. Dave Antil: It’s almost as if you can … you provide … I’m trying to make it simple in my little head … but it’s like big data in a box. One call, and we can kind of drop a big data analytics team at your disposal. Jason Harper: Yeah, yeah. It’s on-demand, on-demand big data services for agencies. Most of RXA comes from an agency background, so we understand the uniqueness of it, and we like it. Dave Antil: Yeah, yeah, yeah. Right. When you dig into a client, I guess looking for generalities if there are any across your client base or your agency base, is like what surprises you? Are you shocked … does anything kind of shock you anymore with kind of the handling, and the manipulation, and the collection of data? Jason Harper: That’s interesting. I think it’s really … it’s neat to see just how different every company we work with is, and then finding patterns. So, it’s they’ve got … like it’s really kind of thinking about … I hadn’t really quite thought about it this way, but like our agency customers are actually the most homogenous. They actually face similar problems in terms of data collection; and it’s messy; and half of it’s Excel; and there was another agency in there before, and so data’s missing. Or they’ve got some clients are happy, and some clients are not happy, and then how do we make the happy ones grow, and how do we help them retain the unhappy customers? That’s actually a fairly … somewhat familiar when we go that. But when we look at like … We work with a couple of really big global pharmaceutical companies, and we’re helping them with a variety of things, but we’re helping both of the with some social media work and analytics around that, and just the … they could not be more different. On the surface they’re doing the same thing, but one company’s run out of the U.S., the other one’s run out of Basel, Switzerland. I mean, it’s just night and day, like it’s just completely night and day. Dave Antil: I’d better lean into this call. Jason Harper: Right, right. It’s like, “Jon, are you … Jon, you need to join this call. I’m in way over my head.” No, it’s … Yeah, it’s interesting to see I think now what I’m seeing in terms of competition, it’s really coming from organizations want to develop and own this capability in-house. We practice a lot of transparency, and we’re … Everything we set up is designed for our customers to take over. The level of sophistication that we’re seeing with the customers, it’s advancing really fast. As an agency, I’d be … I don’t know … I mean, like the clients are all … they all know they need to be investing in data and analytics, because they’re the ones that are going to get a massive return to that investment, right? Jason Harper: It’s just the pace that they’re gaining this capability across the board really is … it’s incredible. Dave Antil: Yeah. For some of those companies and agencies that are maybe a little bit behind the curve, or they’re kind of early stages of this, are there any kind of essential data analytics, kind of hygiene tips that you’d offer? You know, what should they do, what should they stay away from? Jason Harper: Well, I mean, there’s a lot of different choices they’re going to make when they go down this path. I think, number one, it’s adhering to the rigor upfront of understanding why we’re doing analytics, because we do see a lot of times … We come in after our one of our bigger competitors, you may have heard of them, they’re this IBM Watson thing. Not sure if you’ve heard of that. Jason Harper: We run into them out there, right? Jason Harper: They have some great technology, and obviously they’re a thousand times bigger than we are, but we do run in frequently to company made large investment here, and then they’re not getting anything out of it, like that happens a lot. The reason that happens is because you don’t invest in data and analytics to build a giant data environment. You build in data and analytics because you want to figure out where you spend that next half a million dollars, and how you’re going to reach your customers better, or how are you going to retain your customers, things like that. So, making sure that whenever you go down these analytics paths, front and center the business objective. Infrastructure, all that stuff, comes second. Everything is about business questions. How am I’m going to help my client, or how am I, if I am the client, like how am I going to be able to make better decisions, and what are those decisions, and how am I going to measure it? It’s just the real basics that are so important. Dave Antil: Right, right. Before you start to investing, you got to really sit down and ask the questions. I like your comment about ask the why question: Why are we doing this? That’s really interesting. Yeah. Jason Harper: Yeah. It’s missed. Dave Antil: Yeah, right. It’s missed, and people get all super excited about big data, and that’s sort of a meme now, just this notion of big data, because it doesn’t mean anything anymore. People get all excited about just, “I’m doing big data,” or, “I’m collecting data,” but what are you going to do with it? The most important thing, and you kind of … I know … I’ve had the experience with you and your team, and it’s like the people that are looking at the data, and making recommendations, and pulling insights, and telling you what you should do, that’s almost more important than the infrastructure. I mean, you guys did it with Excel worksheets and pivot tables, for god’s sakes, but you did it successfully. Kind of wrapping up a little. I want to respect your time a little bit, but as we’re wrapping up, what makes a good data person? What makes Jason Harper tick? What makes Jon Prantner, your partner at RXA, tick? How do you … what should people look for in a good kind of analytics mind? You need to, number one, be curious and nice to work with. Those are the two things, because no matter what expertise you have, it’s not going to be helpful if others around you can’t access that, and you can’t plug in your expertise into something else. Because this world of data science is so interdependent, and there’s so many different things, whether you’re using an AWS environment and you’ve got that like … or you’re using Snowflake, or H2O.ai needs to intersect with it. It’s like a whole … there’s like all these things that need to come together, and being the super Python wizard isn’t going to help you if you’re not willing to play nice in the sandbox with everyone around you. You run into that. I mean, we’re a bunch of math nerds. I’m fairly introverted math nerd at heart, and when that comes out like I just want to go sit in the corner and read. It’s like you got to find the people who are willing to work together. It’s a real fun space, and we do see … I mean, like there’s so much activity here, it’s … the folks that are coming in, the new folks … Like I said, part of my inspiration was seeing some of the new crop of bright young data scientists out there, and it’s great to see. But, yeah, that’s where I start. Dave Antil: Yeah, yeah. To your point, you know, being a jerk doesn’t help you. When we look back on our time together back in the Organic days, is the team that we had was … We liked each other, we worked well together, there were no jerks among us, and it … we did great things. I think adding one jerk to the mix can really, really spoil things. Jason Harper: Yeah, well, trust … I mean, it’s just like anything, just basics. If we have trust, you can do a lot, right? Jason Harper: You want to make sure that there’s trust, not just within the data science team, but how that data science team interacts with … Especially like we see … We do see the trust between the data scientist and the account person, because that being … Especially, we do a lot of work … We work with some agency partners, and we help them pitch, right? Jason Harper: So, making sure that … like we’re there knowing that, “Hey, we got to close this deal.” We want to build trust with the customer, and we are there to back up the account person. You want to make sure that your … you want your data scientist front and center, because it’s typically a nice showcase piece, and required in a lot of these engagements, like a good data science effort. So, having that trusting relationship there is really important, especially because you don’t want them to say something that would tank a discussion. Dave Antil: Oh, sure. Yeah, yeah. Yeah, that’s all … that’s when things go south. Well, thank you, Jason, for spending time with us. What you guys have built over there at RXA really impressive and exciting. This notion of kind of on-demand data scientists and a analytics team, is a great idea for both big companies and agencies and small and midsize companies and agencies who know they need this and just can’t figure out if they should hire this one guy, or this one gal, but it’s … You’ve kind of made a … created a way for them to kind of have it all, so it’s going to be really exciting to kind of see how you guys do. Tell us, how can people find out more about you, and RXA, and get in touch if they’re looking for it? Dave Antil: Oh, right on. Jason Harper: … which is coming up in middle of March, so we’ll have a booth there. Come check us out. Jason Harper: That’s in Salt Lake City. Dave Antil: Okay, right on. Okay. Jason Harper: Yep, Salt Lake City. It’s March 22, I want to say, and we’ve got a big presentation that Jonathan’s giving, talking all about machine learning and artificial intelligence stuff. Definitely check us out there. Dave Antil: Right on. Yeah, we’ll put a link to that in the show notes so folks can go right to that. Excellent. Well, thank you, Jason, and thanks everyone for listening. If you like the Performance Delivered podcast, please subscribe, at leave us a review on iTunes or your favorite podcast application. If you want to find out more about Symphonic Digital, you can visit us at symphonicdigital.com, or follow us on Twitter at @SymphonicHQ. Thanks again, and see you next time.